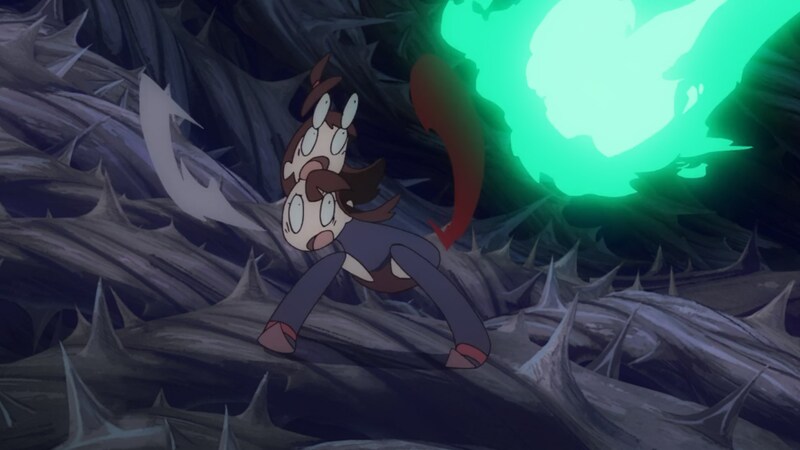 Hiroyuki Imaishi’s episode is unsurprisingly the most Hiroyuki Imaishi episode that Little Witch Academia could ever handle – in a good way, I swear! Let’s explore his work and the way Trigger appears to be approaching this project. Some of my comments on this series end up having better timing than I even intended, and my request for more eccentric magical adventures couldn’t have been fulfilled faster. 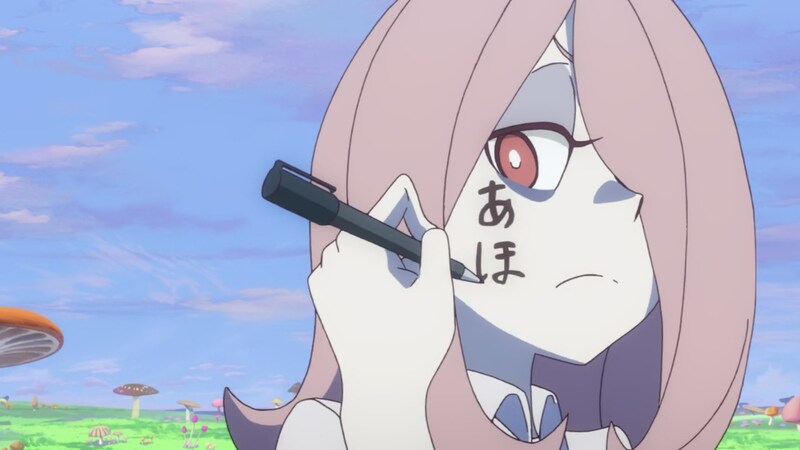 The episode does shed some light on the many facets of Sucy, but it doesn’t really tie that into the overarching narrative and themes like Lotte’s episode did. And that’s perfectly fine now and then! It feels weird to call the most hectic episode a welcome respite, but I really wanted to wander around this magical world – and you know what, crazy magic dreams do qualify. No beating around the bush though, since it would be inappropriate to approach this week’s leading voice with the subtlety he spits at. Hiroyuki Imaishi. An inherently polarizing figure, as you would expect from an artist with such bold personality. Also one of the few creators I feel confident I don’t have to give much of an introduction to; you can crudely sum up his animator persona as the modern era Yoshinori Kanada, but as a director Imaishi is simply Imaishi. This isn’t to say he is particularly innovative, of course; few artists wear their influences on their sleeves as shamelessly as he does, but it’s the mix of all these styles that formed his own that feels unmistakably Imaishi – festive according to the fans, strident for those who disagree. It’s hard to find middle ground. For the longest time I sided with the diehard supporters, but the effects Trigger’s environment had over his work made my faith stumble quite hard. At some point I’d like to write at length about what I feel is a studio issue more than a personal one, and how 00s Gainax and current Trigger are definitely not as similar as people seem to think. But leaving that aside for now, I have to specify that those are problems with Imaishi as series director and thus don’t apply in this instance. For the first time in about 6 years we saw Imaishi working under someone else’s rules to storyboard a full TV anime episode. And the result was fantastic. So, what did he do that’s so special? 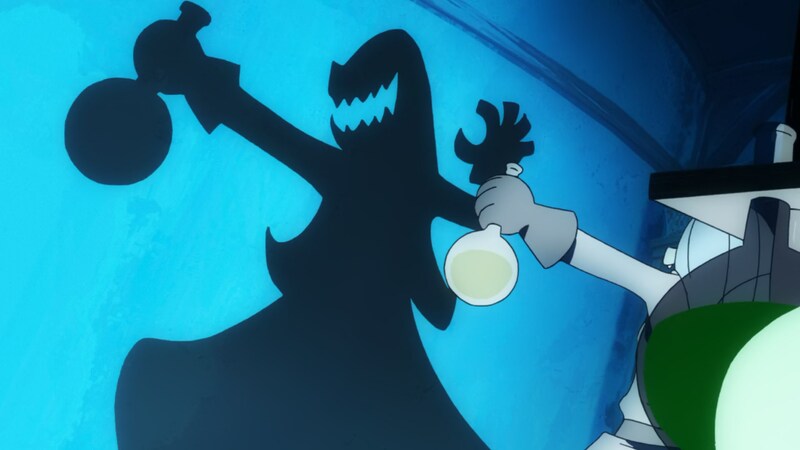 As in your face as Imaishi is, I feel like his greatest asset is an invisible element: the tempo. Imaishi controls the flow of the episode not so much through his framing but with a very particular rhythm. It’s frantic but doesn’t overwhelm, and when it does it’s due to the loud actions themselves rather than the progression. New styles are used and quickly discarded, giving his episodes more variety than right about anyone else’s. Of course there’s a formula to this as well, but I always value execution over originality and his snappy timing simply works. And as chaotic of a project leader as everyone says he is, I feel like his experience has given him a solid grasp of asset management; his approach to storyboarding makes him use more cuts than average, but he weaponizes that requirement to justify the playfully low effort shots he keeps using. 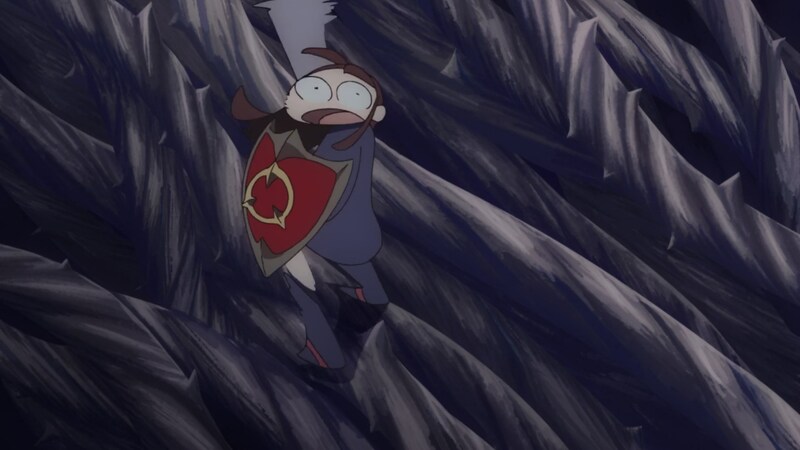 It was particularly evident in this episode, where the first comedic half wasn’t very demanding for the team to allow them to focus on the spectacular setpieces around the end. And of course, if we’re talking about very obvious Imaishi quirks there’s something inescapable – pop culture references. New, newer and old. Recontextualizing infamously nasty situations to increase the tension. 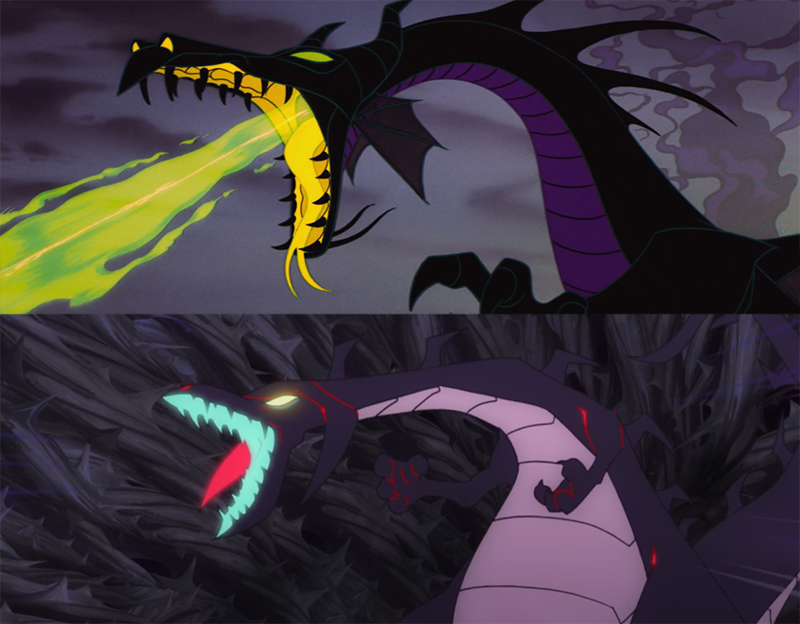 Turning the links with Sleeping Beauty into a quite literal connection at the end with Sucy’s dragon form. Or simply embracing his influences, like the patently Saturday morning cartoon intro that could be straight out of Dexter’s Laboratory. 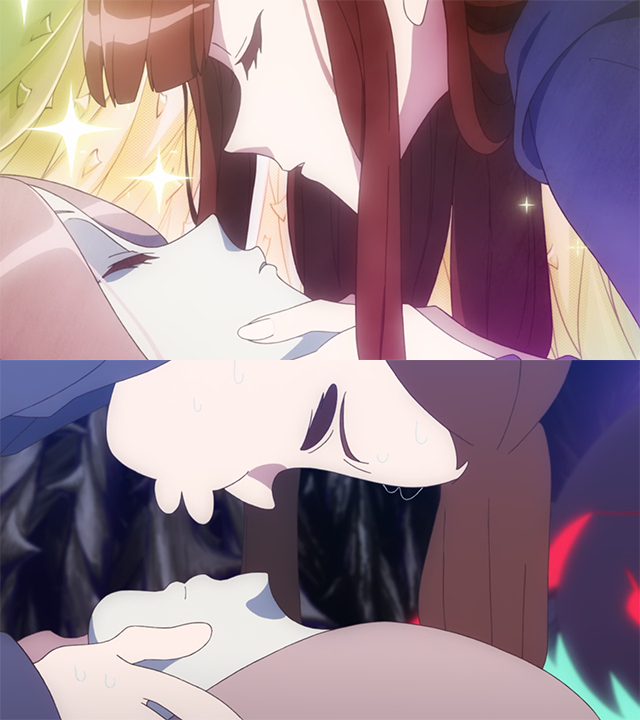 LWA TV has an undercurrent thread of embracing your idols even if they’re not considered refined, and Imaishi really embodies that. His episode stands out for sure, but I feel like he still adapted to Yoshinari’s framework very well. It’s a genuine shame he’s leaving the production after this. As you can see, the key animation credits are neatly separated this time. The very last group corresponds to a Liden Films substudio that once again appeared to assist the production – this is going to be a very regular event all the way till the end of the series, so it’s not very interesting in and of itself. It’s the other two that are worth observing. 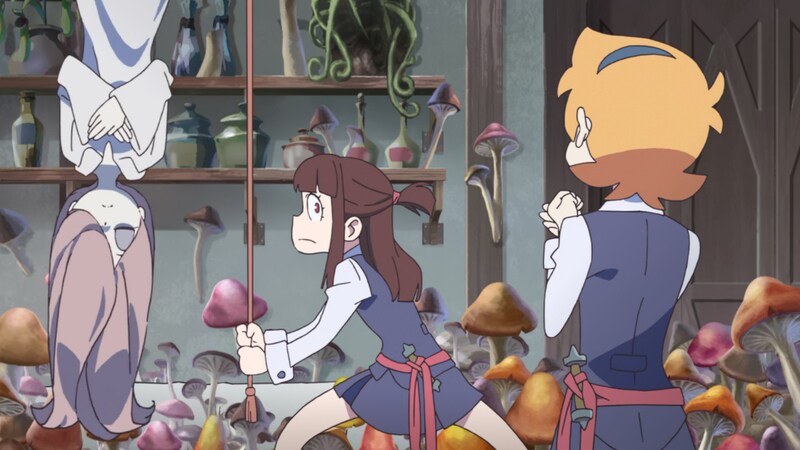 The second one includes nothing but freelance animators who haven’t had a huge presence on this series, whereas the first is a mix of Trigger’s team for this project and people who don’t actually belong to the studio yet have done tons of work for LWA TV. On the one hand this might be the episode that has concentrated the most core staff for the project, demonstrating it was definitely given high priority. But on the other hand, I can’t shake the feeling that the studio isn’t treating this project quite as well as you would expect. Yoneyama “yonema” Mai has been sort of missing from animation ever since Kiznaiver. While he has done some fun work for it, Sushio’s output here can’t even begin to compare to what he did for Kiznaiver. Atsushi “goripon” Nishigori is conspicuously absent from this project, despite having been – by Yoshinari’s own words – the person who rescued LWA: The Enchanted Parade. You can extend this to the myriad of acquaintances Trigger’s crew has, from all the Khara creators they keep a very close relationship with to the freelance stars that always bless their big projects. For some reason or the other, those are barely showing up at all. As a talent magnet this can’t compare to Kill la Kill, let alone something like Gurren Lagann. 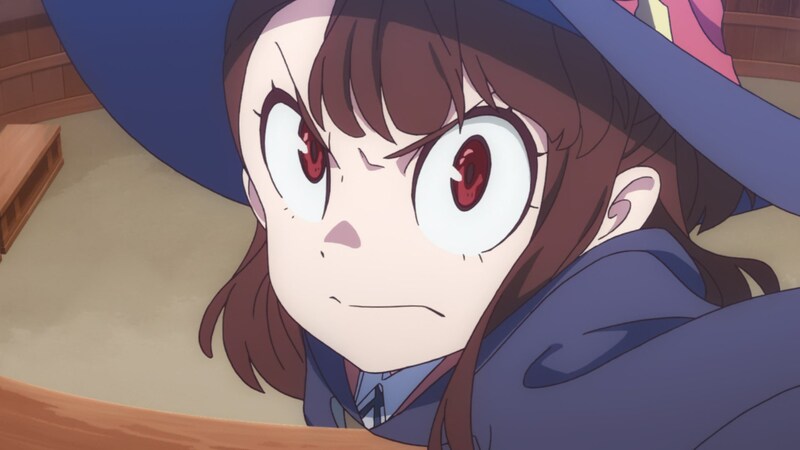 It’s not as if Yoshinari doesn’t share the same valuable set of acquaintances that Imaishi has built, so it makes me wonder if the latter is given higher priority within the company or if LWA TV simply had poor timing – or perhaps a mix of both, since Imaishi does have a project he’s now officially moved to, and I would really expect some of those names to show up over there. 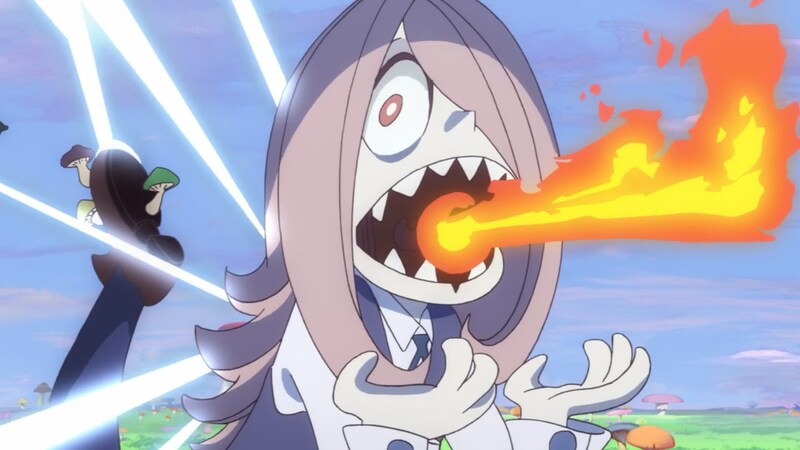 Either way, LWA TV isn’t truly starved for animators, and its star Takafumi Hori might as well be the strongest pure animator at the studio. It’s just relatively worrying that pretty much every memorable cut has been entrusted to a fairly small team, who had to get it done quick enough to move onto their next task. I have faith that the situation might improve though, and that at least the midseason climax will be the veritable industry party it deserves to be. Perhaps we could see people like Tadashi Hiramatsu eventually show up, once he’s freed from his skating boys duties; Yoshinari greatly assisted him on the first episode of Parasyte and he still hasn’t truly returned that favor, besides one quick appearance in Enchanted Parade! The series can survive just fine without spectacular guests like that or even Trigger’s full lineup, but it would be a shame if something as exciting as Yoshinari’s TV directional debut lacked resources it could do with. Let’s wrap this up with some quick comments on the actual animation, which people might care about more than the surrounding circumstances. The most charismatic sequence in the episode is without a doubt Takafumi Hori’s oldschool cartoon film mocking the show’s actual events; it stands out not only due to its technical excellence and original (for this industry) approach, but also because it arrived pre-sourced – just look at Hori’s tweet from before the episode aired! Besides his work, some of Trigger’s younger crew pulled off neat cuts once again; Yuto Kaneko’s debris work is still impressive, and this scene (presumedly by Kai Ikarashi due to the timing) stood out as well. I feel like the approach to animation direction will upset some fans, since they more or less let through everyone’s styles unfiltered. That means some drawings randomly look as if they landed from a different episode, and there’s deliciously loose sequences that no one attempted to restrict. As someone who enjoys noticing the hands of the artists this is far from a complaint, but beware that consistency was the last of their worries. Also, it keeps Kengo Saito’s production marathon, assistant Sakkan and Genga this time around! I’m really glad the show’s production was very ahead by Trigger standards, otherwise he’d be dead. Isn’t it an anormal for “storyboard” and “episode director” to be assigned to different people? I have heard that normally both roles are done by the same individual(s). Also next episode will air on Sarurday night (22:30) instead of Sunday morning (00:00). Is there something meaningful behind it? I want that. Now. Please. 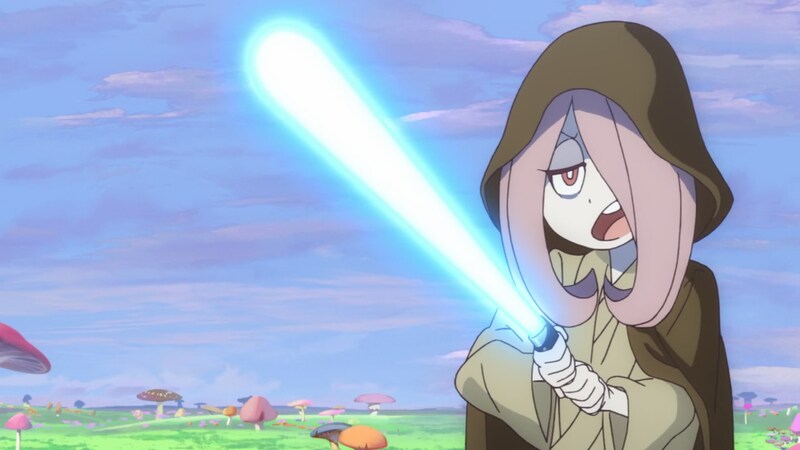 LWA has been very kind to me in presenting opportunities to tie current developments into larger industry&production themes, so I might just do it in a future post if it feels appropriate. Otherwise I’ll make it into its own article, since I think it’s interesting enough to justify it. 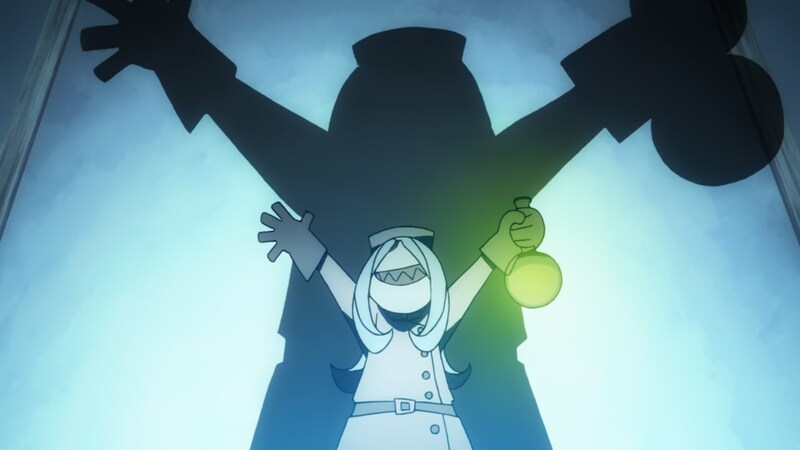 Watching The Dragon Dentist by Khara recently, I was hit by how much GAINAX it felt to me. I now really wish for a Khara TV series.